With the 2012 introduction of Quanser’s Rapid Control Prototyping (RCP) Toolkit for NI LabVIEW and Q1-cRIO control interface module, professors and students using NI LabVIEW are able to interface with over 85 control experiments from Quanser. Now, thanks to Quanser’s recently released LabVIEW-based courseware, they can possess study materials, exercises and more for over 30 hands-on control experiments. These experiments include virtually all of Quanser’s rotaryand linear experiments, as well as some more advanced mechatronic, aerospace and process control systems. The benefits this courseware offers teaching professors and students are significant. Professors save time on course development. Since course material fully compatible with LabVIEW is provided with the experiments, professors wind up with more available for teaching at a high level or conducting research. Instructor and student workbooks include comprehensive student assignments that are ready to use right out of the box. Students can study controls at an introductory or advanced level. LabVIEW is an excellent software platform on which students can learn everything from control fundamentals to advanced concepts through engaging, hands-on experiments. For example, students new to controls can become familiarized with PID control by tuning the control gains on the front panel and examining how the experiment response changes, while more advanced students may wish to modify the block diagram and implement their own feedback control strategies. It’s all possible thanks to fully integrated Quanser courseware and supplied LabVIEW Virtual Instruments (VIs). A wide range of teaching topics. The courseware covers many classic modeling and control topics, including modeling a system using a step response, designing a PID-based controller, and state feedback control. Courseware guides you from set up to lab experiments. 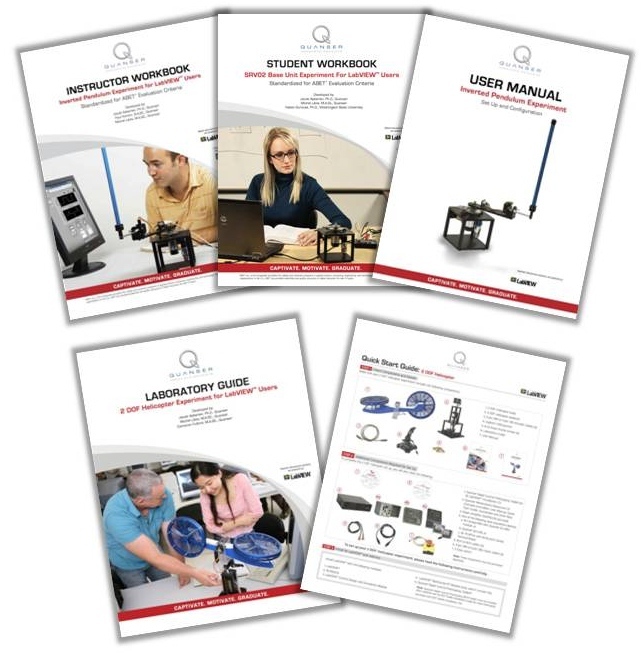 Quanser controls courseware typically includes hard copies and digital copies of Instructor and Student Workbooks and /or Laboratory Guides, a User Manual and a Quick Start Guide. The courseware helps you quickly set up the experiment in your lab, provides a summary of background theory, as well as a set of pre-lab assignments (questions) you can use to test students’ understanding of it before they start the laboratory exercises. Many Quanser systems have multiple sets of lab exercises; for example, with the Rotary Servo Base Unit, you can teach modeling, position control and speed control labs. Laboratory Guides, a User Manual and a Quick Start Guide. ABET-aligned content. The courseware conforms to the requirements established by ABET, Inc., the recognized accreditor for college and university programs in applied science, computing, engineering and technology. This may help your institution in the accreditation process. The alignment process was conducted in collaboration with Professor Hakan Gurocak, Washington State University, Vancouver, USA. Developed by experts. Quanser courseware is authored by an experienced team of Quanser curriculum developers and engineers, headed by ProfessorJacob Apkarian, Ph.D., Quanser’s founder and Chief Technical Officer. In keeping with the integration process, some material was been developed in cooperation with specialists at National Instruments. LabVIEW VIs are included. LabVIEW Virtual Instruments (VIs) are offered with all Quanser experiments. The VIs are based on the laboratory exercises presented in the documentation. You can easily modify the VIs to suit your particular course. Access to the courseware updates. Quanser documentation is regularly reviewed and revised. Changes are based on several criteria including feedback from existing users and collaborating professors, and internal and external peer reviews. We also seek out novel ways to present and deliver our curriculum that would make it easier for professors to adapt the courseware for their specific needs. In the future we plan to introduce an online update mechanism that will give professors access to the latest documentation. If you wish to download a course material sample, click here.